Why are these macronutrients needed in large amounts? They are the components of organic compounds in cells, including water. Carbon is the major element in all macromolecules: carbohydrates, proteins, nucleic acids, lipids, and many other compounds. Carbon accounts for about 50 percent of the composition of the cell. Nitrogen represents 12 percent of the total dry weight of a typical cell and is a component of proteins, nucleic acids, and other cell constituents. Most of the nitrogen available in nature is either atmospheric nitrogen (N2) or another inorganic form. Diatomic (N2) nitrogen, however, can be converted into an organic form only by certain organisms, called nitrogen-fixing organisms. Both hydrogen and oxygen are part of many organic compounds and of water. Phosphorus is required by all organisms for the synthesis of nucleotides and phospholipids. Sulfur is part of the structure of some amino acids such as cysteine and methionine, and is also present in several vitamins and coenzymes. Other important macronutrients are potassium (K), magnesium (Mg), calcium (Ca), and sodium (Na). Although these elements are required in smaller amounts, they are very important for the structure and function of the prokaryotic cell. Prokaryotes not only can use different sources of energy but also different sources of carbon compounds. Recall that organisms that are able to fix inorganic carbon are called autotrophs. Autotrophic prokaryotes synthesize organic molecules from carbon dioxide. In contrast, heterotrophic prokaryotes obtain carbon from organic compounds. To make the picture more complex, the terms that describe how prokaryotes obtain energy and carbon can be combined. Thus, photoautotrophs use energy from sunlight, and carbon from carbon dioxide and water, whereas chemoheterotrophs obtain energy and carbon from an organic chemical source. Chemolitoautotrophs obtain their energy from inorganic compounds, and they build their complex molecules from carbon dioxide. The table below ([link]) summarizes carbon and energy sources in prokaryotes. Carbon is one of the most important macronutrients, and prokaryotes play an important role in the carbon cycle ([link]). Carbon is cycled through Earth’s major reservoirs: land, the atmosphere, aquatic environments, sediments and rocks, and biomass. 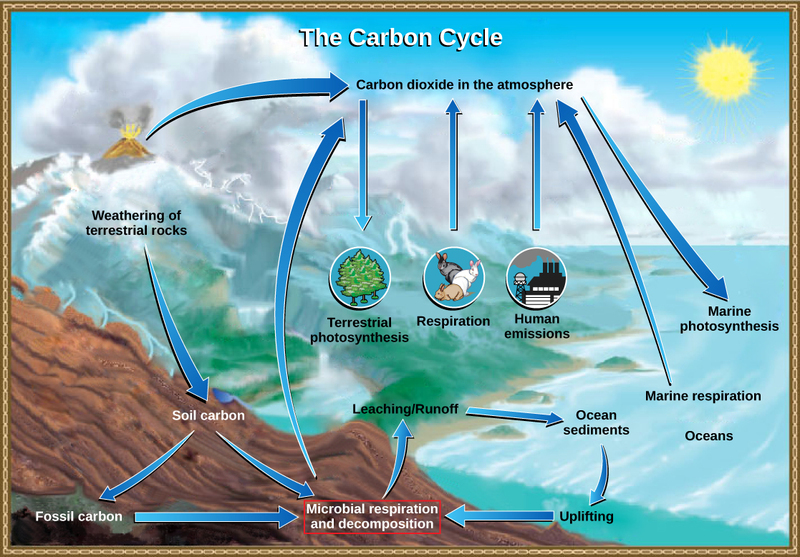 The movement of carbon is via carbon dioxide, which is removed from the atmosphere by land plants and marine prokaryotes, and is returned to the atmosphere via the respiration of chemoorganotrophic organisms, including prokaryotes, fungi, and animals. Although the largest carbon reservoir in terrestrial ecosystems is in rocks and sediments, that carbon is not readily available. A large amount of available carbon is found in land plants. Plants, which are producers, use carbon dioxide from the air to synthesize carbon compounds. Related to this, one very significant source of carbon compounds is humus, which is a mixture of organic materials from dead plants and prokaryotes that have resisted decomposition. Consumers such as animals use organic compounds generated by producers and release carbon dioxide to the atmosphere. Then, bacteria and fungi, collectively called decomposers, carry out the breakdown (decomposition) of plants and animals and their organic compounds. The most important contributor of carbon dioxide to the atmosphere is microbial decomposition of dead material (dead animals, plants, and humus) that undergo respiration. Nitrogen is a very important element for life because it is part of proteins and nucleic acids. It is a macronutrient, and in nature, it is recycled from organic compounds to ammonia, ammonium ions, nitrate, nitrite, and nitrogen gas by myriad processes, many of which are carried out only by prokaryotes. As illustrated in [link], prokaryotes are key to the nitrogen cycle. 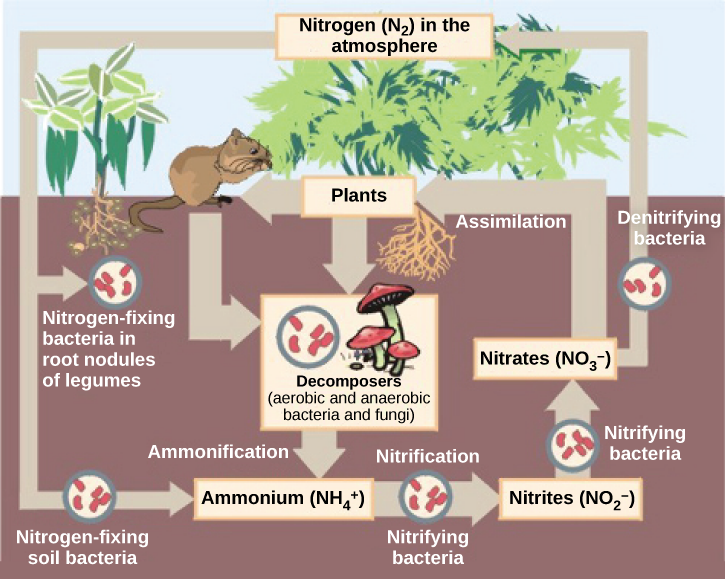 The largest pool of nitrogen available in the terrestrial ecosystem is gaseous nitrogen from the air, but this nitrogen is not usable by plants, which are primary producers. Gaseous nitrogen is transformed, or “fixed” into more readily available forms such as ammonia through the process of nitrogen fixation. Ammonia can be used by plants or converted to other forms. Another source of ammonia is ammonification, the process by which ammonia is released during the decomposition of nitrogen-containing organic compounds. Ammonia released to the atmosphere, however, represents only 15 percent of the total nitrogen released; the rest is as N2 and N2O. Ammonia is catabolized anaerobically by some prokaryotes, yielding N2 as the final product. Nitrification is the conversion of ammonium to nitrite and nitrate. Nitrification in soils is carried out by bacteria belonging to the genera Nitrosomas, Nitrobacter, and Nitrospira. The bacteria performs the reverse process, the reduction of nitrate from the soils to gaseous compounds such as N2O, NO, and N2, a process called denitrification. Prokaryotes are the most metabolically diverse organisms; they flourish in many different environments with various carbon energy and carbon sources, variable temperature, pH, pressure, and water availability. Nutrients required in large amounts are called macronutrients, whereas those required in trace amounts are called micronutrients or trace elements. Macronutrients include C, H, O, N, P, S, K, Mg, Ca, and Na. In addition to these macronutrients, prokaryotes require various metallic elements for growth and enzyme function. Prokaryotes use different sources of energy to assemble macromolecules from smaller molecules. Phototrophs obtain their energy from sunlight, whereas chemotrophs obtain energy from chemical compounds. Prokaryotes play roles in the carbon and nitrogen cycles. Carbon is returned to the atmosphere by the respiration of animals and other chemoorganotrophic organisms. Consumers use organic compounds generated by producers and release carbon dioxide into the atmosphere. The most important contributor of carbon dioxide to the atmosphere is microbial decomposition of dead material. Nitrogen is recycled in nature from organic compounds to ammonia, ammonium ions, nitrite, nitrate, and nitrogen gas. Gaseous nitrogen is transformed into ammonia through nitrogen fixation. Ammonia is anaerobically catabolized by some prokaryotes, yielding N2 as the final product. Nitrification is the conversion of ammonium into nitrite. Nitrification in soils is carried out by bacteria. Denitrification is also performed by bacteria and transforms nitrate from soils into gaseous nitrogen compounds, such as N2O, NO, and N2. Prokaryotic Metabolism by OpenStaxCollege is licensed under a Creative Commons Attribution 4.0 International License, except where otherwise noted.